Media streaming boxes have largely negated the need for home theater PCs when viewing content on the television, but there are still occasions when it’s nice to plop down on the couch, kick up your feet, and be entertained—or even get some work done. 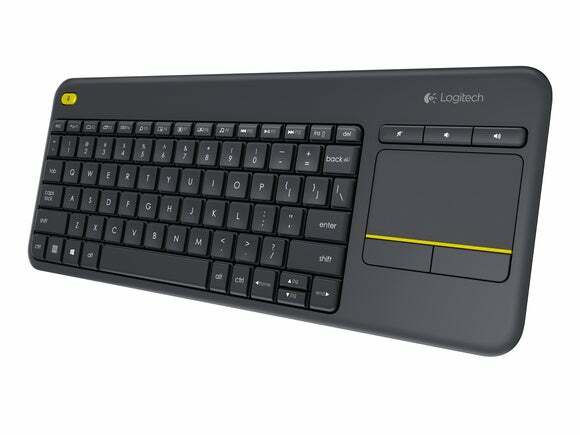 Logitech targets this audience with the Wireless Touch Keyboard K400 Plus ( ), a slim, lightweight, and inexpensive way to control a living room notebook or desktop computer—as long as it doesn’t have an Apple logo on it. As the name implies, the K400 Plus is both wireless (33-foot range) and touch-friendly thanks to the integrated touchpad. Like many recent Logitech accessories, the K400 Plus ditches Bluetooth connectivity in favor of a small, proprietary 2.4GHz Unifying receiver that must be plugged into the computer you want to control. However, Logitech doesn’t specifically state Mac support from this product; the company says it works with Windows 7 or later (including Windows 10), Chrome OS, and Android 5.0 or later devices (but not smartphones and tablets) with the required USB port—which is not to say the K400 Plus won’t work on OS X. As a plug-and-play device, the downloadable Logitech Options software indeed pairs the keyboard with a Mac, but without customized control options. Weighing just over 13 ounces with batteries, the K400 Plus is comfortable to use and features an attractive, durable housing—Logitech calls it black, but I’d describe it as charcoal grey, with a hint of yellow trim. There’s no mistaking this keyboard is made from plastic, but it feels solid considering the price. The K400 Plus is a full-sized keyboard, with a top row of 12 that serve double-duty as function or shortcut keys. Some of the functions include switching between applications, search, maximizing the window, or controlling the default media player with previous/next track and play/pause buttons. Above the slightly smallish 3-by-2-inch touchpad are a volume mute and two up/down control buttons, with traditional left and right mouse-click below. A yellow button in the upper left corner functions as left mouse-click for those who prefer two-handed control. Using Logitech Options, the K400 Plus can be configured for touch tap, Caps Lock notification, low-battery warning, and custom shortcuts. The actual keys themselves aren’t as noisy as other Logitech keyboards I’ve used, for a quieter typing experience—within 55 dbA, according to the company, who claims the plastic digits are good for up to five million keystrokes. (I’ll have to take their word on that.) The squared-off keys are just the right size and depth, although the angle of the keyboard is quite low and clearly not designed with desk use in mind. I tested the K400 Plus on the mid-2007 Mac mini in my living room, and a Windows 10 virtual machine running on Parallels 11 and my MacBook Pro with Retina Display without issues (lack of OS X customization aside). The Windows key serves double-duty as a Mac Command/Apple key, although placement of the Function key is a little awkward being sandwiched between it and the Control key. The Logitech Wireless Touch Keyboard K400 Plus is an affordable way to lean back and take control of a home theater PC, but Mac owners will want to pass due to the lack of OS X software support.